I realize I've completely slacked and didn't officially mention it here but we bought a new house! It's something Andrew and I really took our time on and prayed for the right answer and over time, we felt in our heart going with the new build we first fell in love with is the way to go. It's so appealing to us (more me than him, ha!) knowing this home will be built for us and we're not coming into something someone else has already called home. I love the idea that we will be getting things dirty first and we will be making memories in that backyard before anyone else did- it's ours. We listed our home within days of signing the contract on the new house and within the first week of it being up, we had 2 offers! We're now in the middle of a contract and will be closing April 15th on our current home so in just under a month, we're saying goodbye, moving in with Andrew's parents for a couple months and then will be welcoming our new digs in August! So we're actually pretty far into things with the new development and visited the design center to pick all our finishes already so I thought it was about time to share the aesthetic of where we're going with this baby! 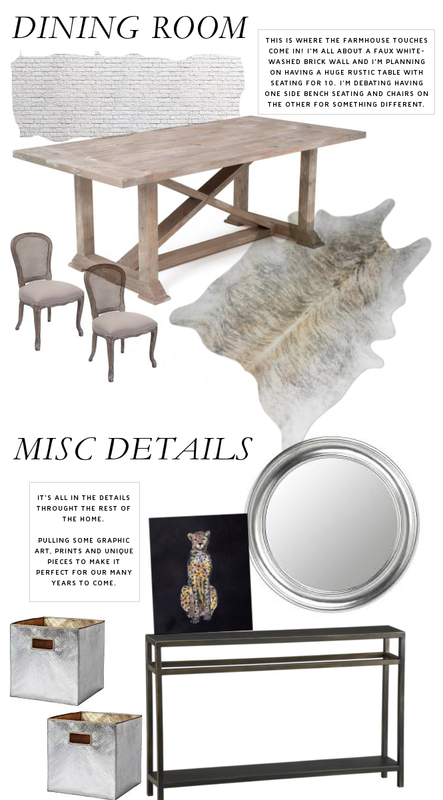 My definition if probably Farmhouse Chic... bahahah- whatever that means! We are just so pumped to see it all come to life over the next couple months and to see them break ground on the lot very soon! It's completely surreal knowing Emery will be celebrating her first birthday in our forever home and that Drake has his own guest suite.... I mean what 9 year old has a walk in closet and bathroom attached to their rooms? I'll do my best to share pictures and details along the way- happy weekend! 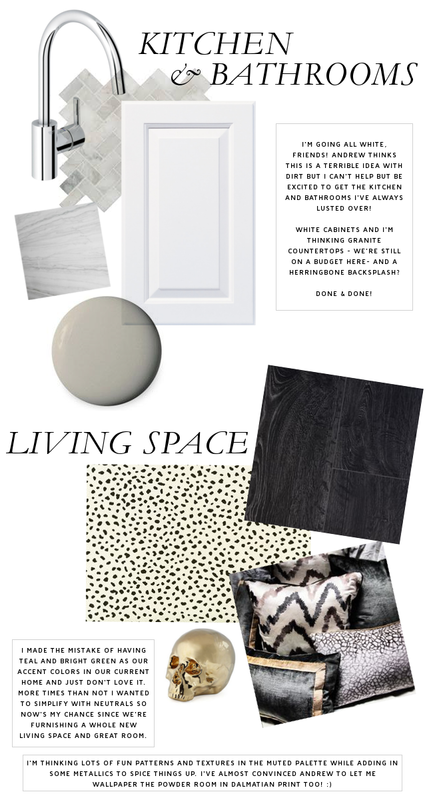 I love all of this, especially the white kitchen! Can't wait to see the finished product! a white kitchen sounds perfect! How exciting! I love the brick idea. Brick will always be timeless!! Can't wait to see everything you do! It's so great to have a blank canvas to work with! I love that dining table and I think your kitchen and details are going to look phenomenal! Do the bench! It's so fun and helps squeeze more people in at the table for big dinners and gatherings!